I’m in LOVE! One of my favorite illustrations recently in the studio is hand-painting wedding couples. I’ve been studying Folk Art for several months now and LOVE the simplicity of the style. It is truly a challenge to simplify my art since I am more of a realistic style of painter. 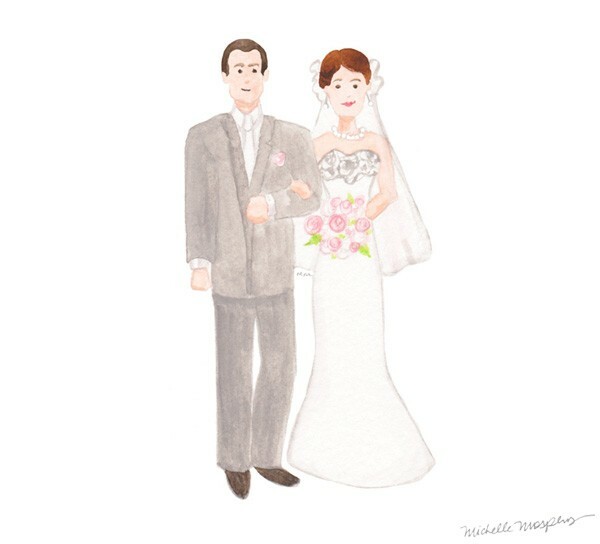 I adore illustrating wedding couples with watercolor paints for a transparent dreamy look. 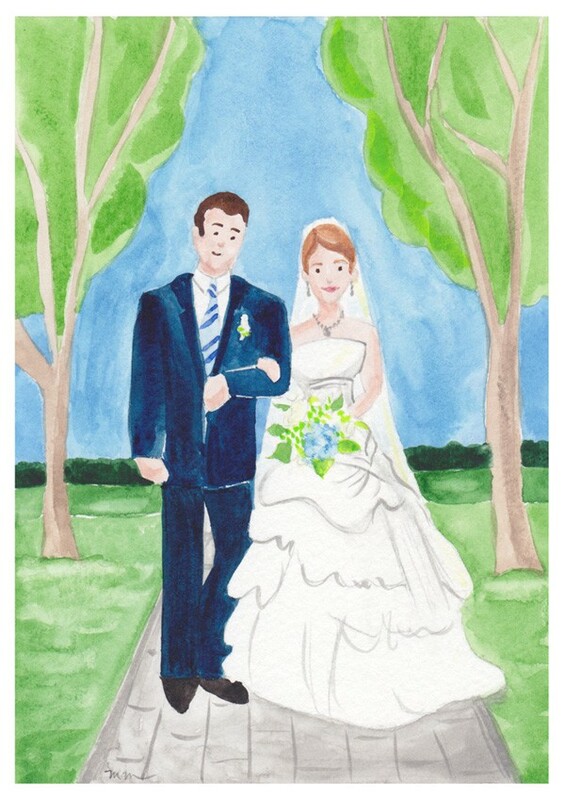 I painted the wedding couple above for Kelley and Anthony’s thank you cards. Super sweet! Another wedding couple illustration I painted was for a very sweet client Sarah and her new husband William. The brides’ dresses are custom illustrated to match their bridal gowns they wore on their wedding day! The grooms’ attire was painted to match what they actually wore on their wedding day. So much fun! If you are interested in custom thank you cards with personalized portrait or an adorable wedding couple portrait painting, let me know. I just adore creating them. Plus they are super cute gifts for weddings, engagements, Christmas, anniversaries, or just because! I am in LOVE with cursive style fonts! My favorite cursive font is Business Penmanship. The business handwriting font is vintage and lovely! It reminds me of the 3rd grade when I first learned cursive writing. 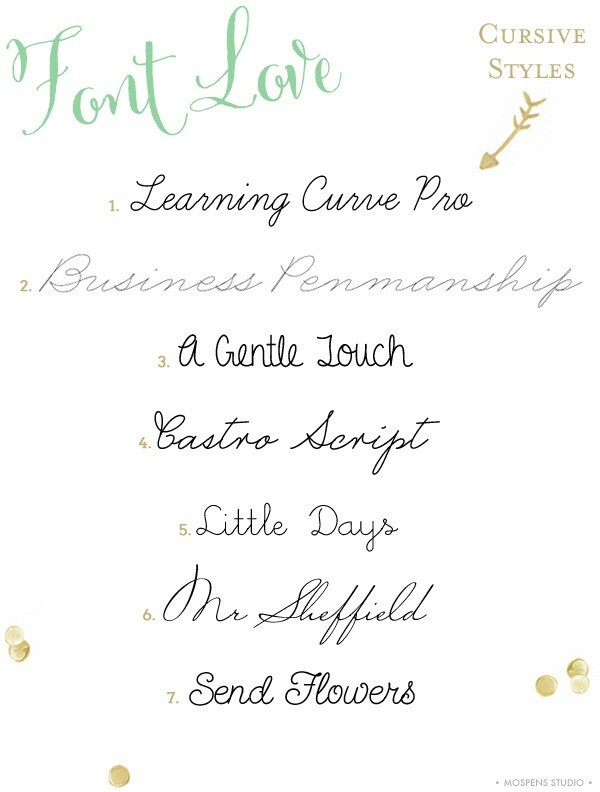 Following are my 7 favorite cursive fonts! 1. Learning Curve – Freebie! 3. A Gentle Touch – Freebie! 5. Little Days – Freebie! 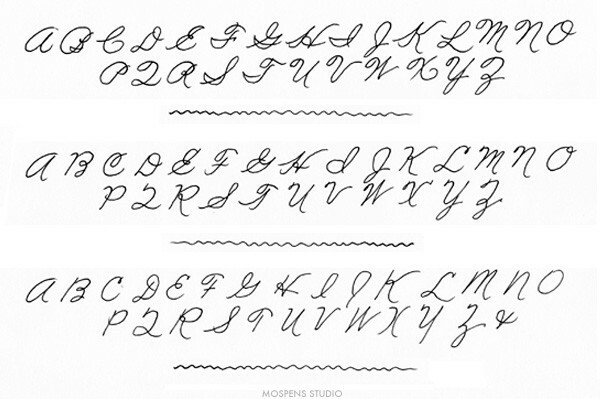 I found a detailed website regarding how to write in cursive Business Penmanship style writing. The font style is so elegant and smooth. I took a quick practice sketch run with the ideas on their site. I love the handwriting style fonts for addressing envelopes! If you think you have chicken scratch for writing, these fonts will come to your rescue this holiday. Perfect for addressing those Christmas Cards. Checkout a few of my NEW Christmas Cards in our etsy shop! I will be adding more new designs this weekend as they are created. Yay! This week my favorite fonts have a nautical flair! I adore all things nautical. After work during the spring, summer, and early fall you will find my family and I sitting lakeside enjoying the serene scene. Just lovely! If you are not a DIYer and need save the dates! Sneak a Peek at my recent NAUTICAL SAVE THE DATES designs!! MANY more to come, of course! So stay tuned!! 1. Cafe Mimi – Adorable font that, to me, mimics nautical boat rope. 2. Caslon Antique – The perfect VINTAGE nautical font. 3. Singapur – Heavy – Nicely nautical! 4. Affair – Elegant nautical. Perfect for an elegant nautical themed wedding by the sea! 5. Bergamot – Fun nautical and casual font. 6. Castro Script – Creative and personal. I just love the curves on this font. 7. 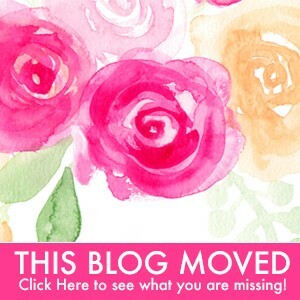 Hagin Caps Medium – Freebie! Bold nautical! Now this font makes a statement. 8. Nelly Script – Swirly like the sea. Perfect for a nautical wedding. 9. Sailor Larry Fade – Another Freebie! Exactly what a sailor of the sea would look like if he were a font! 10. Saltpetre – Super fun hand-written nautical fun. I’m. In. Love! 11. Send Flowers – Loving this font, reminds me of rolling waves of the ocean. But wearing a smile. More favs in FONT LOVE Series #6 that also perfect for a nautical event! Check them out. Happy Friday to you and have a lovely weekend now. YUMMMMmmm! Yesterday was National Cake Decorating Day. So at the end of the day I just HAD to whip up these delightful watercolor cakes! 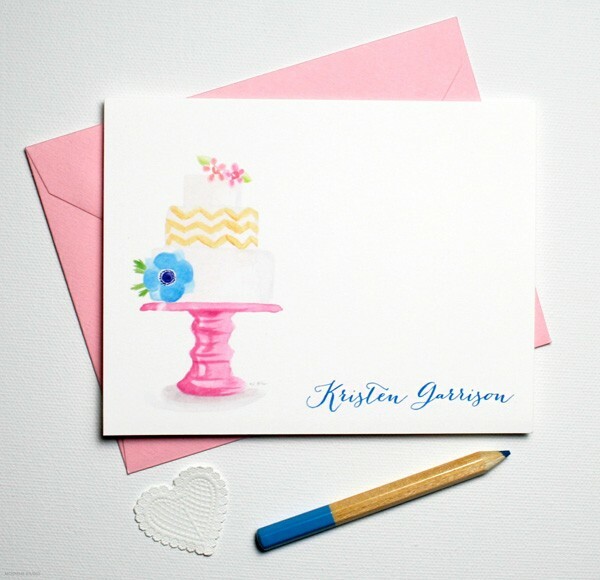 After my art received RAVE reviews on our Facebook Page, I added cake personalized stationery to the shop for you to enjoy! Gold Birthday Cake Stationery. Perfect for the talented cake decorator! 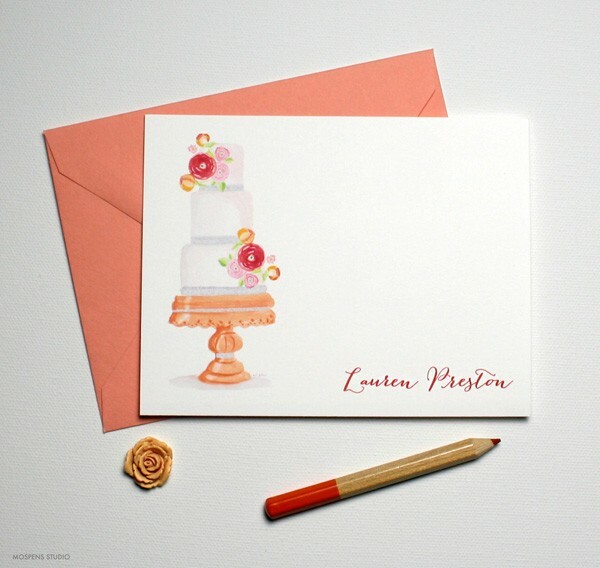 Fancy Birthday Cake Personalized Note Cards. Just lovely for the wedding cake artist! 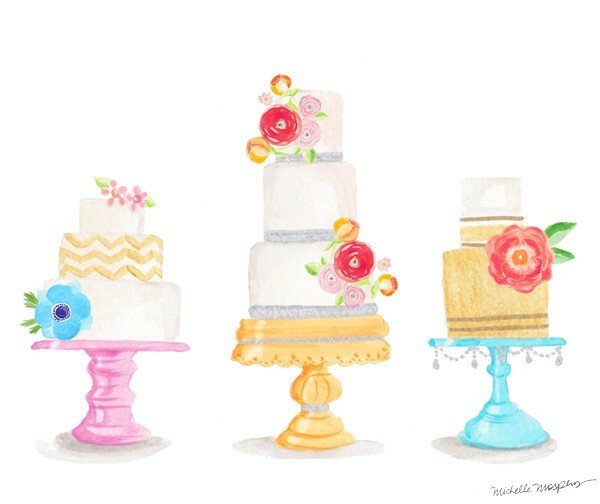 Watercolor Wedding Cake Thank You Notes. Fabulous for bridal shower or wedding thank you notes! Remember to mail out thank you cards immediately after receiving a gift. 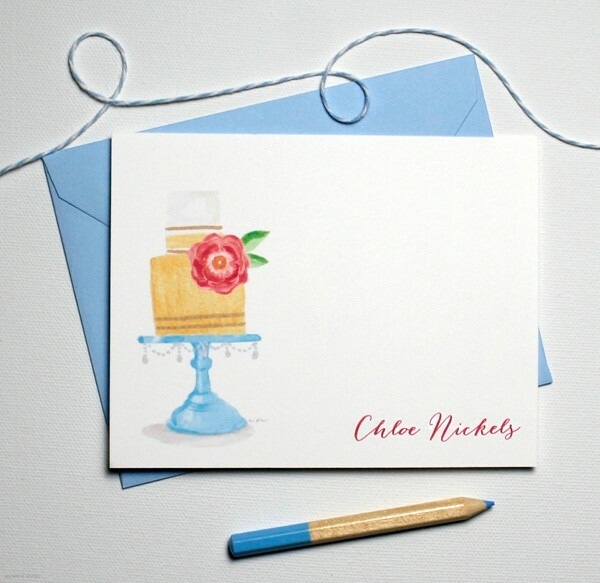 Have a set of personalized stationery notes on your desk ready to go. Sold in sets of 15 our decorative YUMMY cake notes are perfect for gifts. NO calories too! ENJOY! This collection of fonts are my favorite for beach wedding invitations and destination wedding stationery. Fun. Fresh. And going with the flow! That is my type of font. 1. Always – This font is still popular for beach wedding couple names on custom invitations in our studio! 2. Aphrodite – A handmade romantic font that is perfect for a nautical beach wedding. 3. Bellucia – Not brand new, however this is a keeper. LOVE the hand-calligraphy look. Just perfect! 5. Carolyna Pro – A fabulous calligraphy style font. The swirls remind me of ocean waves! 7. La Portenia – A lovely flourishing script reminds me of writing in the sand. 8. Memoir – Romantic handwritten font. Also reminds me of writing in the sand! 9. Ministry – A 1920s American ad art script with a modern twist. Lovely! 10. Miss Le Gatees – In the 1930s hand-lettering was a very popular occupation, this font mimics the handwritten legible nature of the hand letter artists craft. 11. Montague Script – One of the most lovely brush-script fonts I have seen and used. 12. Satisfaction – Inspired by 1930s ads, this font is a popular handwritten style for invitations today. 13. Tagettes – This font is a freebie! Fun and pirate like. Often used for an island wedding invitation design. More favs in FONT LOVE Series #3 that fit for a beach chic event too! Check them out. Happy Weekend to you! Enjoy!! Woweee! This week FLEW by! I hope yours was a great one. For FONT LOVE Series #5 I wanted to share Mospens Studio most popular block style fonts for wedding invitations. Many of these fonts are used as ALL CAPS or both upper and lowercase. You will find serif and sans-serif fonts. 1. Mrs Eaves Lining – Love the vintage look of this serif font. 2. 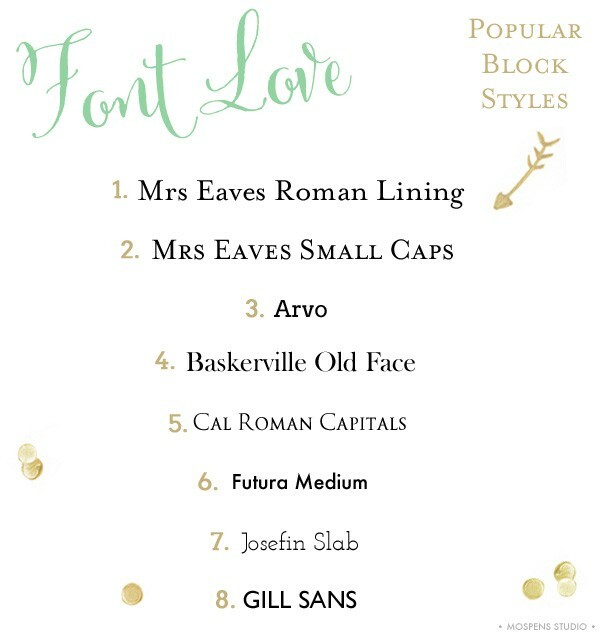 Mrs Eaves All Caps – The MOST popular block font everrr for wedding invitations. 3. Arvo – Freebie! Super clean and lovely serif font. 4. Baskerville Old Face – Vintage and easy to read. 5. Cal Roman Capitals – Classy! All caps only. 6. Futura Medium – Upper and lower case or all caps, this font is a great sans-serif choice. 7. Josefin Slab – Freebie! Charming serif font. 8. Gill Sans – Another great font used in upper and lower case or all caps, no serifs here. Many options! 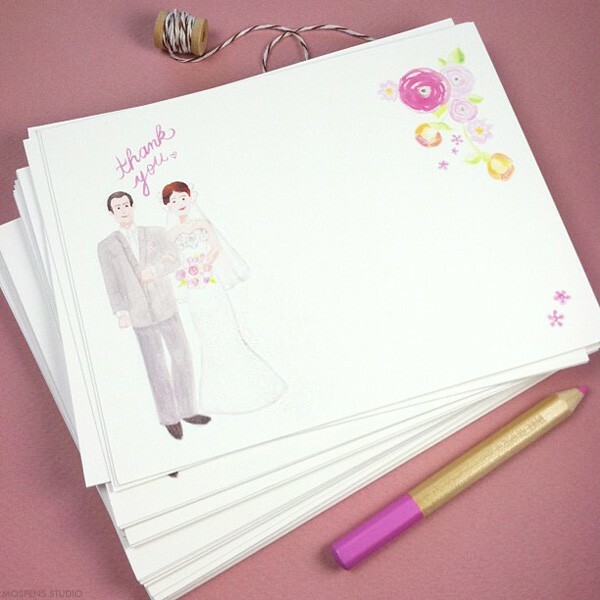 This weekend I am continuing to work on my 2014 wedding invitations collection! Soooo excited. Painting flowers has ALWAYS (since I was 5ish) been a true love of mine. I am so VERY grateful I get to paint watercolor flowers and other fun motifs every day. Yay! … I thank you for your support of our small family business!! 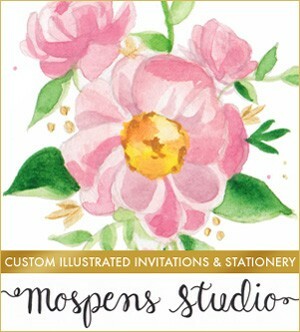 Browse a few more custom painted invitations artworks in my online portfolio. Custom invitation designs and stationery can be designed with my existing art or have me paint brand new art for you. HEADS UP! 2014 wedding couples are proving to be organized and great planners. James and I are working with many wedding couples who are getting married in January – July 2014 already! Please be sure to start your order with us early if you want us to design an awesome custom invitation design for you. We would LOVE to work with you! !